Brigid was a slip of a girl with a mass of red-gold curls. It drove the nuns wild, that hair, for however much they combed it sprang back into a cloud. The girl ran wild too, although she had such a sweet nature none could not be cross with her for long. Not that she was often around to be told off. Brigid loved to be outside: she would slip out of the convent and dance barefoot through the long grass in a manner not becoming to a novice nun. She was a problem, that was for sure: daughter of a serving maid by her master, only their Christian charity had given her a home. The lord Dubhthach was said to be a wizard, one of the old faith who knew more than was right of mystery and magic. At least her mother had been baptised by the good Saint Patrick himself. In the end, the wise old abbess let the girl have her way. 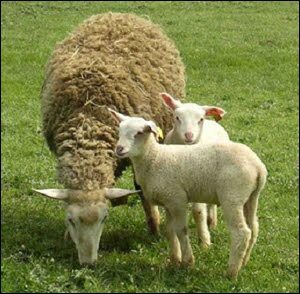 Brigid was put in charge of the convent flock, and spent long happy days playing in the pastures. Under her care, the sheep gave thrice as much milk as they had before. The nuns were not the only ones to benefit. Brigid was a kind-hearted child, always willing to help those in need. She would let any thirsty passer-by drink his fill, but miraculously the milk-pails were always full at the end of the day. The nuns saw the good-will this earned them in the village and sensibly held their peace. As she grew older, Brigid remained just as kind but she became cannier. One day the lord of Leicester was visiting, and she asked for alms to feed the poor. When he refused, she begged him for a patch of land – “Just as much as I can cover with my cloak”. Now that cloak was woven of fine Irish linen but with a weft as loose as a baby’s bowels. Four of the sisters took hold of the hem and began to stretch it out like a fishing net. He laughed as they backed away and promised to give enough land to keep them in food for a year. Another time, thieves stole cattle from a local farmer: the river rose up to block their escape, and as they swam across their clothes were washed away. The men returned dripping naked to beg for forgiveness. Brigid brewed ale for the poor too – rumour said she changed her own bathwater into beer: and her example inspired the local innkeepers so that none ever went without in that part of the land. She learnt what she could of namesake, too. Brighid – ‘Bright One’ – was a Celtic deity, daughter of the great Dagda and a reknowned poetess. She was born at sunrise as her mother walked over a threshold, so that she belonged ‘both within and without’. 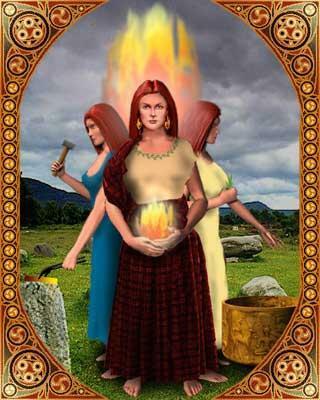 Brighid was said to have two sisters, one of them a physician and the other a craft-smith: but more likely they were all one person, a triune goddess of creativity and healing and sacred fire. She presided over the festival of Imbolg (In belly) or Oimelc (Ewe’s milk), when the sheep drop their lambs. 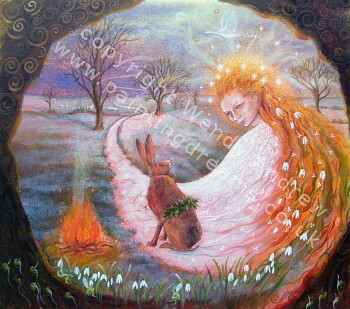 This was celebrated on the ‘quarter day’ midway between the Yule solstice and the Eostre spring equinox, and was a time especially sacred to women. When she grew up, our Brigid became Abbess of Kildare herself. She was known both for her wisdom and her compassion. She kept the old ways in Christian fashion: she was said to have power over both fire and water, and many stories are told of her healing miracles. Where the hem of her robe touched the ground, snowdrops and crocuses sprang up. To honour the hearth fire that women tend in every home, she kept a flame tended by nine maidens burning in a sanctuary that no man was permitted to enter. Brigid was eventually consecrated as a bishop, which was unusual in her day too. When she died, she was made a saint – the patroness of poets, blacksmiths and healers. She is often portrayed with a cow at her feet, holding a crozier (bishop’s crook) and a lamp. 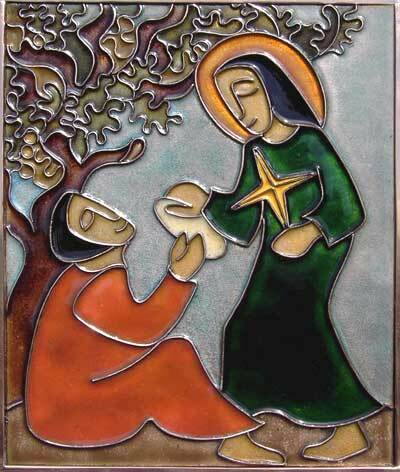 The Feast of St Brigid is held on 1st February, the day before Candlemass. It is a festival of song and light and purification. 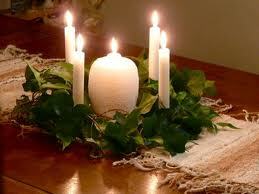 And if Gaelic Brighid is honoured too at this time, there is no conflict in those celebrations. More stories in ‘LifeWorks‘ by Jane Bailey Bain. Follow Jane on Twitter @janebaileybain. If you like this post, use the buttons below to Share on Facebook, Twitter or Stumbleupon. This entry was posted in History, Mythology, Religion and tagged Bridget, Brighid, Brigid, Celtic, Fire, Goddess, Imbolg, Ireland, Kildare, Oimelc, Saint, St. Bookmark the permalink.